A coffee addict and evening bookworm, Megan enjoys few things more than exploring the world with her husband, son and dog. With a diverse background in everything from graphic design to digital marketing, Megan joined the KPS3 crew in 2018 as an account director, bringing over eight years of marketing and communications experience with her. When she’s not in our offices helping clients and their projects excel, you can find her lost in a good book or curled up with a great cup of coffee (or both). Graduating with distinction, Megan earned her B.A. in journalism with a minor in digital media from the University of Nevada in 2010. 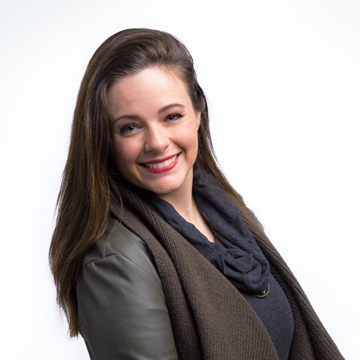 Upon graduation, Megan joined the team at Innerwest Advertising and Public Relations as a graphic designer, where her super-sharp designs earned Innerwest Advertising the honor of “Best Overall Marketing Campaign” in the 2013 BANNer awards. From there, Megan took her design-driven eye and results-driven mind to Noble Studios where she accepted a position as a strategy coordinator and, later, as a digital media specialist—a role in which she increased organic site traffic for a global education client by 73 percent year over year. Prior to joining KPS3, Megan worked as the marketing and communications director for Sierra Nevada Journeys, an outdoor science education non-profit serving Nevada and California. You can often find her hiking in the nearby Sierra or embarking on a West Coast road-trip with her family, though she says her greatest adventure yet has been raising her son. A weekend baker, when she’s not caking dirt in her hiking boots she’s likely flouring up her rolling pin and whipping up something something warm, flaky and utterly delicious to (​hopefully​) share with her coworkers.